Entrepreneurs Brief Guide - How to Manage Your Responsibilities as a Leader. Managing a team is like juggling several balls at once and if you drop one ball, the entire pattern gets spoiled. 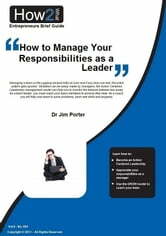 Mistakes can be easily made by managers; the Action Centered Leadership management model can help you to monitor the balance between key areas. As a team leader, you must coach your team members to achieve their best. As a coach, you will help your team to solve problems, learn new skills and progress. In 30 minutes, learn how to: (a) Become an Action Centered Leadership, (b) Appreciate your responsibilities as a manager, (c) Use the GROW model to coach your team and (d) Improve your team’s performance.